Yesterday the Holy Robe experienced being stormed by the largest group of pilgrims. The summit: they were there as pilgrims and not as tourists. 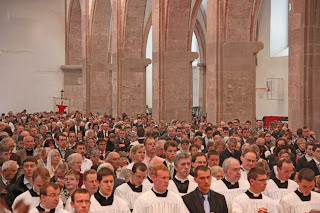 (kreuz.net) On Sunday 2,500 Traditionalists pilgrimaged to the Holy Robe of Trier. 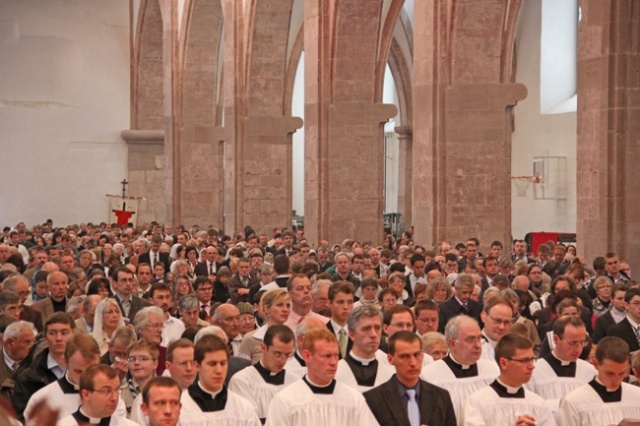 The Old Liberal Diocese refused them Holy Mass in Trier Basilica or in another house of worship. There "was a welcome to the pilgrims and pilgrimesses of this group." The Abbey church was was completely full from the entrance doors to the transepts for the solemn levitical Liturgy. Father Stefan Frey --- the Rector of the Society Seminary of Zaitzkofen near Regensburg -- preached for the feast. It just so happened that he spoke about the negotiation of the Society with Rome. It was there he assured the faithful that it did not mean that unification with the Vatican means that the battle for the Catholic Faith would be given up. The piety of the faithful present was impressive. In the sight of the struggle of the Old Liberal hardliners against the Faith, the pilgrims came to doubt in the course of reconciliation with Rome on the pilgrimage. Many fear that after the Society will be slowed down by an agreement with the Novus Ordo Conciliar Church and the German church-tax apparatus. 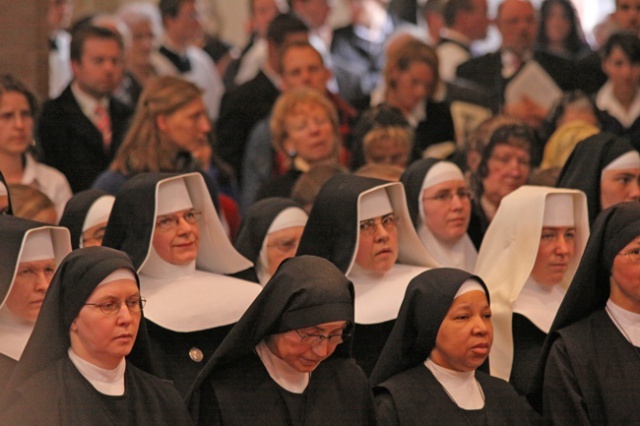 By contrast, Father Marc Gensbittel -- the Prior of Saarbrucken -- explained in a lecture on Sunday morning that the Society will have a "reconciliation" with the Vatican, where they will have their own niche and have "freedom of opinion" in the Conciliar Church. On the pilgrimage even academic Catholics showed themselves critical against the reconciliation. The fear was aired that it could be accompanied with a betrayal of the faith and on the unbroken dogmatic tradition of the Church. The onslaught of the faithful was impressive -- although many Southern Germans and Bavarians were on other May Pilgrimages. After Holy Mass there were even too few places to eat for the pilgrims in front of the Abbey church. During lunch they were thanked privately by many of the older missionaries and priests, who were drawn back to the time of their own priestly consecrations or encouraged again to remain true to them. 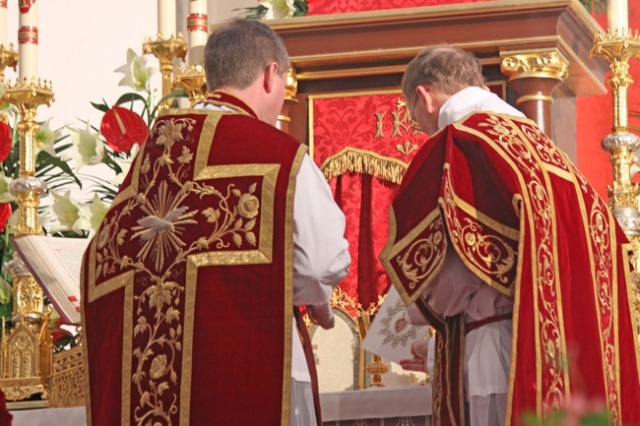 The arch-conservative SSPX makes a pilgrimage to Trier with about 2,000 followers. For critics, this does not fit the idea of ​an ecumenical pilgrimage - the SSPX among other things believe that all other religions are simply "wrong."